Bill Gates' physical body might reside in the present, but his brain lives in the future. The billionaire philanthropist has made a career out of predicting what will happen in matters of computing, public health, and the environment. He correctly predicted the rise of smartphones and social media, and a wealth of evidence suggests his latest predictions could be on the right track, too. Here's what Gates envisions for the future of our world. Bioterrorism could wipe out 33 million people in less than a year. In February, Bill Gates remarked at a conference in Munich, Germany that one of the biggest threats to global health is an airbone pathogen deployed by bioterrorists. It could be a synthetic smallpox virus or a super-flu that is far deadlier than normal strains. Epidemiologists "say there is a reasonable probability the world will experience such an outbreak in the next 10-15 years," Gates noted . In just a year, the right bug could wipe out 33 million people. For this reason, Gates and his foundation have made widespread vaccination one of their top priorities around the world. When it comes to food, Africa will become entirely self-sufficient. In his 2015 Gates Annual Letter, Gates made the prediction that Africa's agriculture industry will increase productivity by 50% by 2030, making the entire continent self-sufficient. Currently, the continent imports roughly $50 billion worth of food each year, despite the fact that 70% of residents in sub-Saharan Africa are farmers. "In the next 15 years, however, innovations in farming will erase these brutal ironies," Gates wrote. "The world has already developed better fertilizer and crops that are more productive, nutritious, and drought- and disease-resistant; with access to these and other existing technologies, African farmers could theoretically double their yields." In African countries where cash is hard to come by, people often face the difficult choice of paying for healthcare, food, education, or repairs — all four aren't always an option. Gates says this results from poor banking infrastructure. Financial services like M-PESA are providing access to digital bank accounts in countries like Kenya and Uganda. People who may not have previously had access to banking services can use those accounts to store money more easily. "By 2030, 2 billion people who don't have a bank account today will be storing money and making payment with their phones," he wrote in his 2015 Annual Letter. "And by then, mobile money providers will be offering the full range of financial services, from interest-bearing savings accounts to credit to insurance." By 2035, there could be almost no poor countries. In the letter, Gates defined "poverty" as the World Bank does, which is a daily budget of just $1.90. There are people in some 35 countries who fit that profile. "Almost all countries will be what we now call lower-middle income or richer," Gates explained. "Countries will learn from their most productive neighbors and benefit from innovations like new vaccines, better seeds, and the digital revolution." By 2030, the world will discover a clean-energy breakthrough to power our world . One of Gates' more hopeful predictions came in 2016 when he declared that wind, solar, or some other renewable resource will power the majority of the world within the next 15 years. "The challenge we face is big, perhaps bigger than many people imagine," he wrote in his Annual Letter. "But so is the opportunity." Many of the poor countries he visited had no running water or electricity. At night this meant they couldn't light or power their homes, keep businesses open, or run vital medical centers. "If the world can find a source of cheap, clean energy, it will do more than halt climate change," he wrote. "It will transform the lives of millions of the poorest families." Countless jobs will be lost to automation. Over the next 20 years, warehouses and factories across the country are poised to replace human workers with automated robots, Gates says. The resultant loss to the labor force could be in the thousands, if not millions, depending on which industries automate jobs the most. "You cross the threshold of job-replacement of certain activities all sort of at once," he told Quartz . His vision for this future involves essentially taxing the robots who perform this labor, in order to preserve the income tax you'd otherwise get from a human. The world could eradicate polio by 2019. 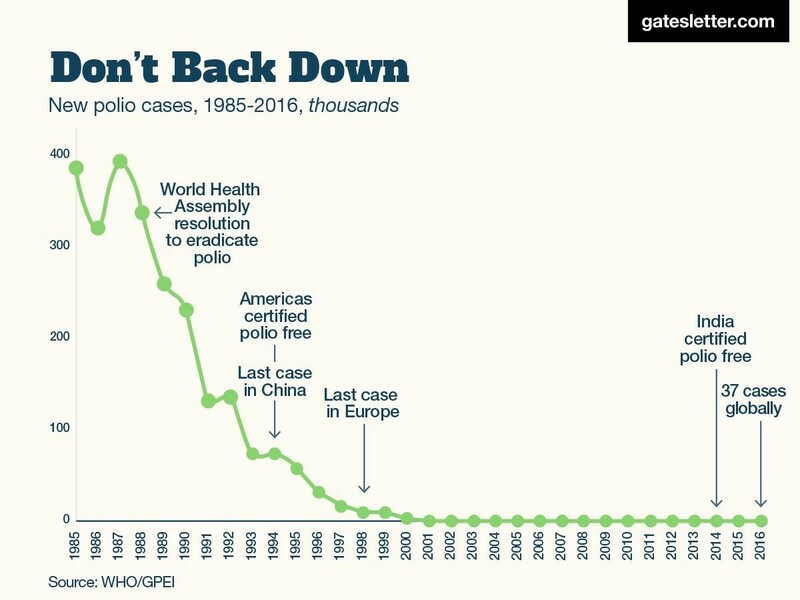 By last count in 2016, the world saw just 37 new cases of polio. That's down from more than 400 in the late 1980s. All told, only a few hundred cases remain around the world, and Gates is hopeful the disease will become the second disease, after smallpox, to disappear for good. "The global polio community is now finalizing a detailed plan that I believe should allow us to finish the job of polio eradication within the next six years," he wrote in his 2013 Annual Letter, adding that the initiatives should further vaccination awareness in general. "The legacy of polio eradication will live beyond stopping a disease that once paralyzed over 400,000 children every year," he wrote.